Eliot is looking much cleaner after our annual Spring Clean-Up on May 22 sponsored by Metro and the Bureau of Planning and Sustainability. About 50 families brought their unwanted items and junk to the clean-up site at Legacy Emanuel parking lot on Williams and Graham. We collected 4 dumpsters full of junk, 1333 pounds of electronics to be recycled, many boxes of books, hundreds of articles of clothing, reusable household items and a pick up truck full of scrap metal. Donations from the event totaled close to $800 which will be used to help sponsor events like the free Dawson Park Concerts, the Jambalaya festival, the Soul Stroll and other neighborhood events. This is the Eliot Neighborhood Association’s main fund raiser for the year so it was good to see so many residents in attendance. The event would not have been as successful without our sponsors Sparky’s Pizza, Ex Novo, Legacy Emanuel, NECN, Volunteers of America, and Green Century Electronics Recycling. We had an amazing crew of volunteers and want to extend a sincere and enormous thank you. We could not have run this event as smoothly without their help. 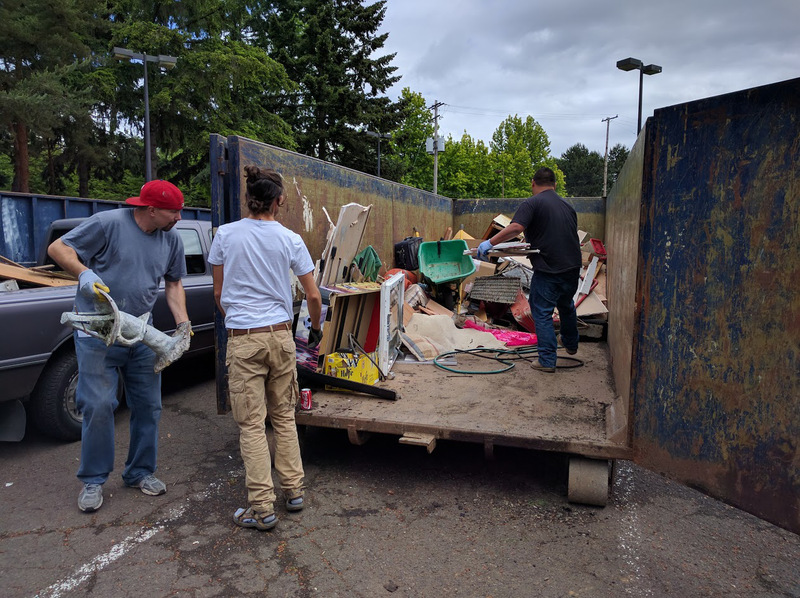 We had help from the neighborhood association board, committee members and residents, Ex Novo’s Communitas service group, New Seasons, and Volunteers of America’s Men’s Residential Center. Their untiring help and organization the day of the event was definitely appreciated and hopefully they had a good enough time to help out next year too!